A delicious recipe to make jelly from a pumpkin for eg a topping of a tartlet or stuffing a muffin, cake. Here is Greensweet jam jelly crystal processed. Cut the small pumpkin with the skin into pieces and cook until they are almost done. 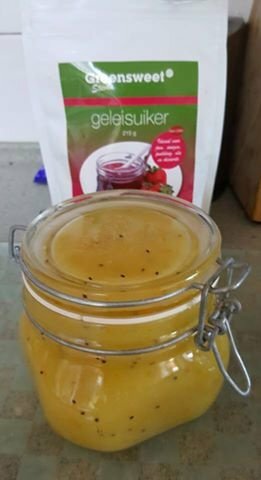 Add 1 pear and 1 kiwi together with the 15 grams Greensweet Jam Jelly Crystal. Let this boil and then puree. Just taste whether it is flavored and then put it in a jar.